Although this haul is very small, I just wanted to share with you what I brought. I decided to buy brushes, because I needed them more! The first brushes I were eco-friendly and were really good, but their were more face brushes, then eye brushes. So that wasn't really helpful to me. It was only one eye shadow brush. I rarely shop online, I always go to the store. But I was bored one day and I guess this is what happened! I am really excited to try these brushes! I also brought some things from BH cosmetics, but that's for another post! The eye shadow brush is supposed to help apply the eye shadow evenly and make it easier. This sounds good, because the brushes I used in the past were tough and hard. It seemed like I had to put a lot of eye shadow on, before it actually showed up on my eyes. This brush is supposed to blend the eye shadows, while softening dramatic edges and lines. This is really good, because before I had to use the same eye shadow brush to blend. That was a wreck, because the bristles were hard and that irritated my eyelids. This brush is good for setting powder and liquid concealer! The eye crease brush is able to pick up a lot of eye shadow color. It also sweeps it onto the lid to crease bold definition. It also says that it blends and contours in the crease and corners of the eye. This brush is also great for smudging the shadow into the lash line for a smoky effect. This sounds really great, especially if I want a smoky eye look! These brushes only cost $1, but they still look like good quality brushes. The brush itself (the bristles) feel really soft and the handle or the part you hold has a good grip. I definitely think these brushes are going to be my favorite ones so far. In another post I will let you all know how they work! I Love All These Brushes I use Them All The Time !!! Thank you! Glad to know you use them, now I know they have to work! Brushes are always a great thing to get! Have a great day! Great haul! New brushes are great because without a good brush, your products won't have the best application! Great Haul! 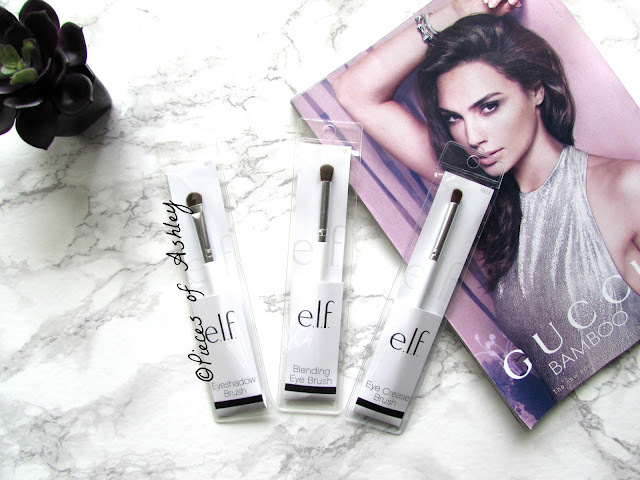 I love elf brushes they are such great quality and very affordable too! I recommend you try the elf studio line brushes, those are even better. Bargain brushes - sometimes they're better than higher priced ones....wonderful post! I have always wanted to try elf cosmetics! I love the layout of your blog, and your header is so pretty! I came from the bblogger blog hop! If you could check out my blog and give me some advice that would be fantastic! I definitely recommend these brushes! Thank you for the comment and I checked out your blog! I left a comment! Yeah, It's a great deal!